Redevelop Slum Land on Win-Win Basis in Kampala. 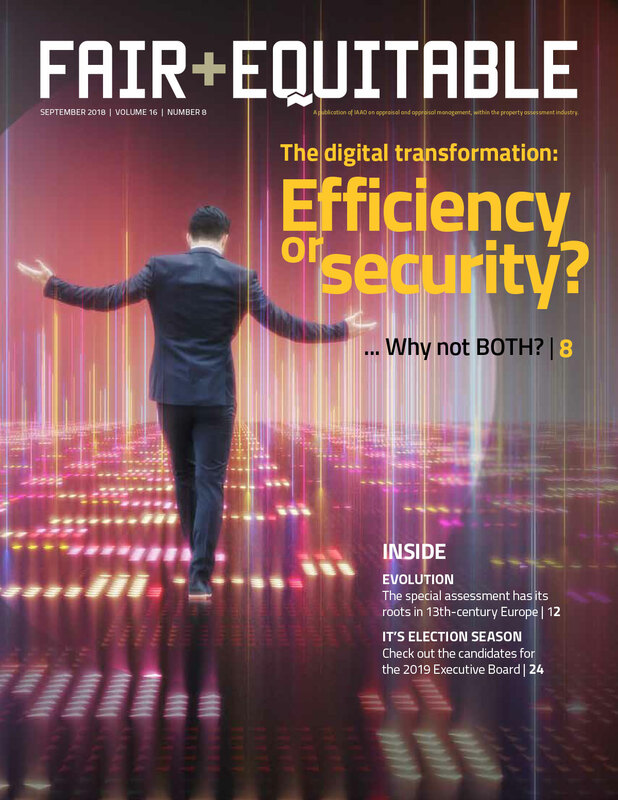 The following is an article of Dr.Sopon Pornchokchai, President, Agency for Real Estate Affairs (www.area.co.th) and Director, Thai Real Estate Business School which was published at a journal of the International Association of Assessing Officers, namely, the Fair+Equitable, Vol 16, No.8, September 2018, p.22-23. This paper presents the feasibility of converting slum land to profitable commercial development to the ultimate benefit of the public at large. This strategy would be ideal for inner city or central business district slum land. The key to success is converting land value from the very low value of the existing slums to the potential use as commercial development. Slums are in the informal housing sector with substandard living conditions for the occupants. It is always a challenge to redevelop these slums in a way that is beneficial for all involved. This brief study was conducted during a class on property valuation which the Thai Real Estate Business School (TREBS) conducted for the Kampala Capital City Authority (KCCA). 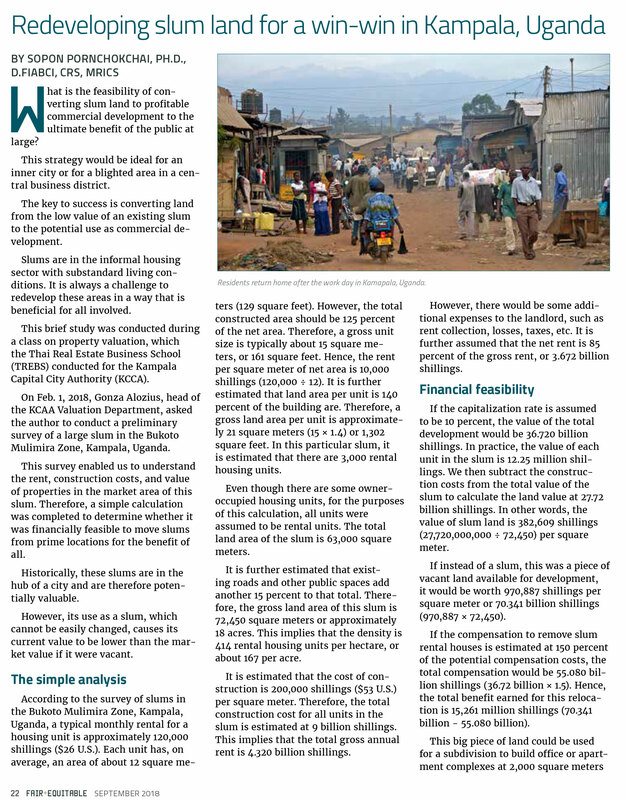 On February 1, 2018, Mr.Gonza Alozius, Head, Valuation Department of the KCCA asked the Author to conduct a preliminary survey of a large slum in the Bukoto Mulimira Zone, Kampala, Uganda. This survey enabled the Author to understand the rent, construction costs and value of properties in the market area where this slum is located. Therefore, a simple calculation was completed to see whether it was financially feasible to relocate slums from prime locations for the benefit of all. Historically, these slums are located in the hub of the city and are, therefore, potentially valuable. However, its existing use as a slum, which cannot be easily changed, causes its current value to be lower than the market value if it were vacant. According to the survey of slums in the Bukoto Mulimira Zone, Kampala, Uganda, a typical monthly rental for a housing unit is approximately 120,000 shillings (26 US dollars). Each unit has, on average, an area of approximately 12 square meters (129 square feet). However, the total constructed area should be 125% of the net area. Therefore, a gross unit size is typically about 15 square meters or 161 square feet. Hence, the rent per square meter of net area is 10,000 shillings (120,000/12). It is further estimated that land area per unit is 140% of the building are. Therefore, a gross land area per unit is approximately 21 square meters (15 x 1.4) or 1,302 square feet. In this particular slum, it is estimated that there are 3,000 rental housing units. Even though there are some owner-occupied housing units, for the purposes of this calculation, all units were assumed to be rental units. The total land area of the slum is 63,000 square meters. It is further estimated that existing roads and other pubic spaces add another 15% to that total. Therefore, the gross land area of this slum is 72,450 square meters or approximately 18 acres. 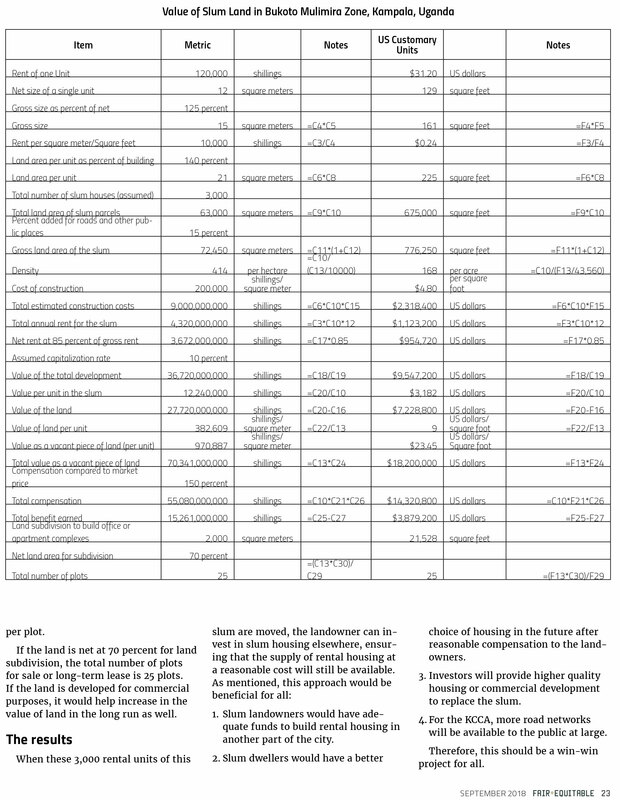 This implies that the density is 414 rental housing units per hectare or approximately 167 per acre. It is estimated that the cost of construction is 200,000 shillings (53 US dollars) per square meter. Therefore, the total construction cost for all units in the slum is estimated at 9 billion shillings. This implies that the total gross annual rent is 4.320 billion shillings. However, there would be some additional expenses to the landlord such as rent collection, losses, taxes and the like. It is further assumed that the net rent is 85% of the gross rent, or 3.672 billion shillings. If the capitalization rate is assumed to be 10%, the value of the total development would be 36.720 billion shillings. In practice, the value of each unit in the slum is 12.25 million shillings. We then subtract the construction costs from the total value of the slum to calculate the land value at 27.72 billion shillings. 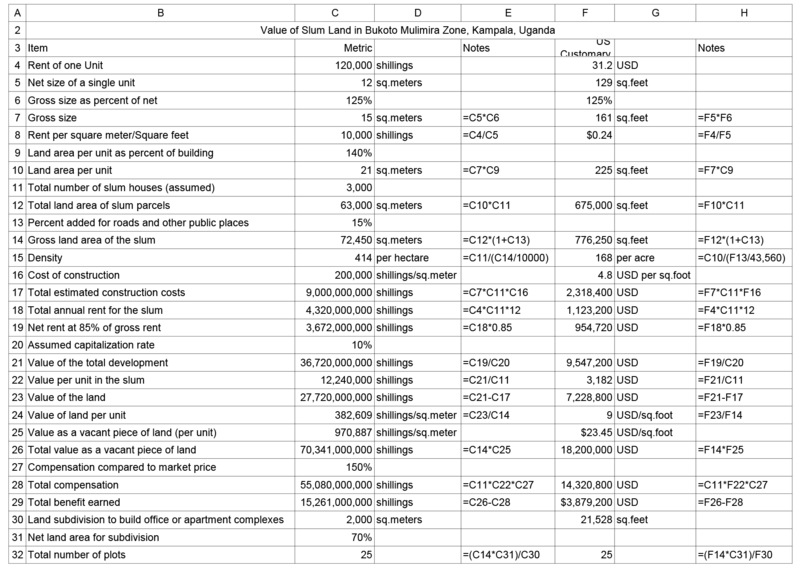 In other words, the value of slum land is 382,609 shillings (27,720,000,000/72,450)per square meter. If instead of a slum this was a piece of vacant land available for development, it would be worth 970,887 shillings per square meter or 70.341 billion shillings (970,887 x 72,450). If the compensation to remove slum rental houses is estimated at 150% of the potential compensation costs, the total compensation would be 55.080 billion shillings (36.72 billion x 1.5). Hence, the total benefit earned for this relocation is 15,261 million shillings (70.341 billion – 55.080 billion). This big piece of land could be used for land subdivision to build office or apartment complexes at 2,000 square meters per plot. If the land is net at 70% for land subdivision, the total number of plots for sale or long-term lease is 25 plots. If the land is developed for commercial purposes, it would help increase in the value of land in the long run as well. 1. For slum land owners, they would have adequate funds to build rental housing somewhere else in the city. 2. For slum dwellers, they would be able to have better supplies of housing in the future after the reasonable compensation to the land owners. 3. For investors, there will be more quality housing or commercial development to replace this slum. 4. For the KCCA, there will be more road network available to the public at large. Therefore, this should be a successful project and a win win situation for all.